Try Something new - Like Bamboo Stick Massage! 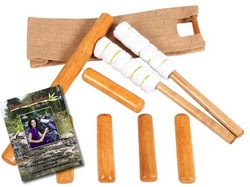 Go Green with 100% solid bamboo massage tools. 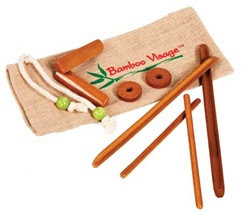 Learn a new, luxurious massage modality using bamboo of various shapes and sizes. This set is designed to be warmed and used directly on the skin in conjunction with your favorite massage lotion, crème or oil. Easy on your hands and wrists. Ideal for all treatment modalities including deep tissue and full body. For best results, warm your Bamboo Fusion Warm Bamboo Sticks with 14" x 27" Moist Heating Pads. Set includes 8 piece stick set, 2 tapotement wraps, carry bag, and Table Version DVD. 60 day warranty. Learn a new, unique and easy way to deliver seated chair massage. By using these bamboo tools, you will be able to market new services while offering an effective treatment that doesn’t feel like you’re using tools. Sticks glide easily over all fabrics and can be chilled for spot treatments or used at room temperature. Set includes 8 piece stick set, 2 tapotement wraps, and carry bag. Allows massage therapists and estheticians to learn a new and exotic way to perform facial massage. This massage can be offered as a standalone treatment or as a perfect finishing touch to a full-body massage. A delicate stick set of 8 bamboo sticks especially designed for the face is used for this treatment. 60 day warranty. A wonderful treatment by itself or the perfect finishing touch to complete a full body massage. Ths exotic "French facial massage" will increase the flow of oxygen, blood, and nutrients to the facial area leaving the client's skin soft and supple.